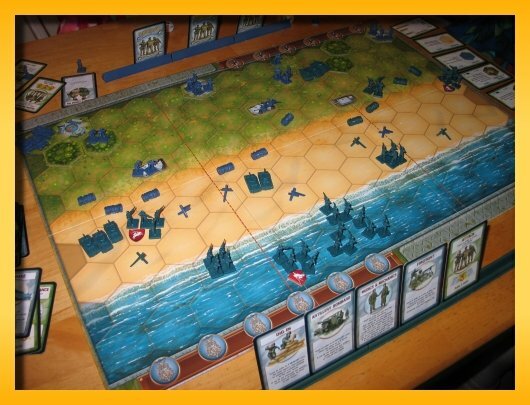 Sophie and I played the Sword Beach Scenario of Memoir ’44 again tonight. Last time, I could not defeat her bunkered artillary in the center section. But tonight was a rout with me winning 5 badges to 1. After surviving a fairly devastating Air Power attack midgame I was able to defeat her artillary after sweeping in from the right flank with armor, infantry, and British Commandos. Noah and I had a go at a couple rounds of Rumis. 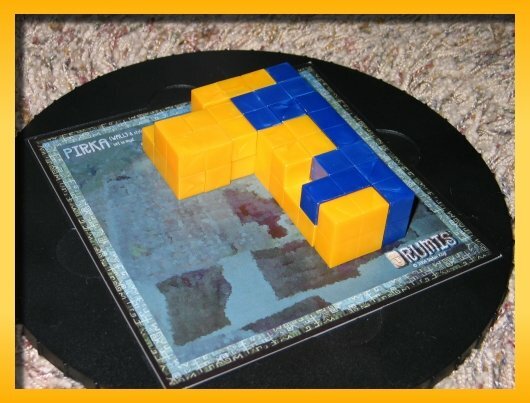 In Rumis you take turns placing colored Tetris/Blokus shaped pieces onto a grid. The grid and height restrictions are defined by the chosen playing board. The only rules are 1) when you lay your piece, your piece must touch faces with at least one of your already positioned pieces and 2) you cannot create a hole or gap such that you can’t fill it by dropping a block vertically onto the structure. The winner is the player who covers the most top surface area. So at the end of the game, you have to look directly down onto the structure and count blocks of each color. Rumis is a great game for winding up the evening and it’s easy to get several quick games in. 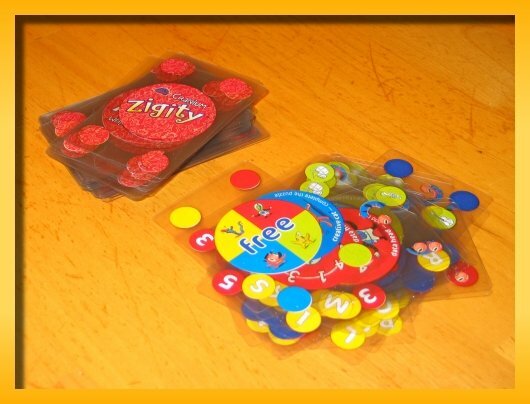 Pulled from a recent BGG geeklist comes this dexterity game for those without colds! The little poem at the bottom of the box is great. 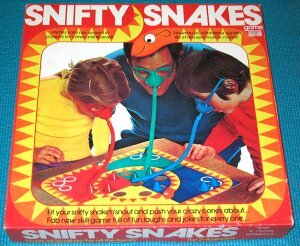 You can read more about Snifty Snakes on BGG. I would think that being a spectator would be more fun than actually playing! Author mattPosted on October 19, 2005 January 27, 2016 Categories All Posts, Board GamesLeave a comment on That Game is Nifty…er…Snifty! After a few games of Hive with Noah, Sophie joined us to play a game of Himalaya. We only played a partial game since we were just working through the rules and we needed to get a good night’s sleep in the motel and then get up to go to Kings Island in the morning. Himalaya has a nice tempo to the game. You program the next 6 actions your caravaner is going to take behind your screen and then everyone simultaneously exposes their program. You then play out your program a move at a time. Your programmed action allows your caravaner to pick up a good in a village (salt, barley, tea, jade, gold), move to another village along one of three types of paths (ice, stone, sand), or deliver goods that have been ordered by a village. If you deliver goods (that you’ve collected in other villages) to a village with an order, then you get to perform two of three kinds of actions: take the order ring which increases the number of yaks in your herd, place a stupa in the village (if one isn’t already there – stupa’s are center’s of worship), or send out delagates into the regions around the village. The type of village determines the number of delegates you can send out (1, 2, or 3). There are always 5 villages with goods and 5 different villages with orders before any programming occurs. You roll a D20 to determine which villages get the goods replentished and new orders each round. At the end of the game, the winner is the player with the most ‘power’ in 2 of the three areas of influence: economic (# yaks in your herd), religious (stupas), political (delegates). If no one player has a majority in 2 areas then there are additional rules for breaking ties and determining a winner. The kids caught on very quickly but Sophie and I kept messing up our programming. We kept traversing to a village to pick up a good but then forget to program the action that let us pick up the good. Instead our next action would be to leave the village (empty handed)….arg!!! After a bit, we got the hang of it. All three of us liked the game and I think it’s a keeper. I love buying new games but I have to admit, I can’t stand waiting for them to arrive. For quite a while I’ve been intrigued by the game Himalaya. 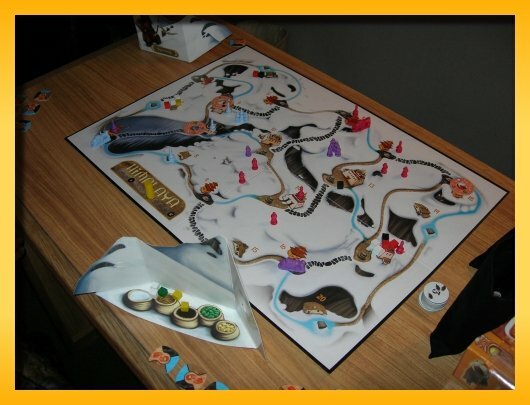 The game was originally freely available for download in a “make and play” format but Tilsit picked up the game and is producing copies and, understandably, the free downloads stopped. I ordered a copy and I’m now watching the package move across the United States at a snail’s pace. Being able to track your package online is one of the greatest yet simultaneously most mind numbingly stressful feature of today’s online experience. What do you mean it left Harrisburg PA! It’s been in PA for 3 days now! Anyway, when the game arrives I’ll have much more to say and some pictures to share but in the meantime, I’m dying over here! Author mattPosted on October 12, 2005 January 27, 2016 Categories All Posts, Board GamesLeave a comment on I’m dying here! I Juan to win sometime! Lisa and I played San Juan tonight. San Juan is a lighter, card-based form of Puerto Rico. It has a lot of the same elements but the game is simplified since there are no ships to load and you do not need to supply your production plants with colonists before producing goods. 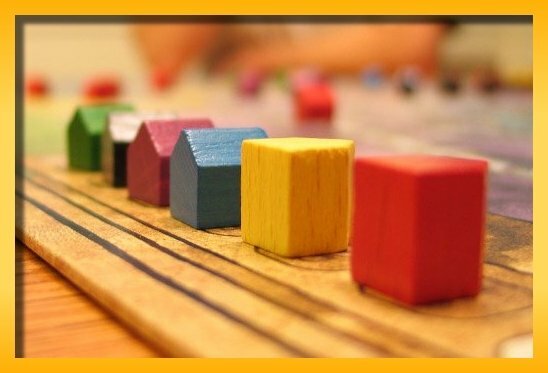 The game has the same flavor of choosing a role (Prospector, Counselor, Builder, Producer, Trader) that everyone will take the action for. As in Puerto Rico, the chooser takes a privilege. 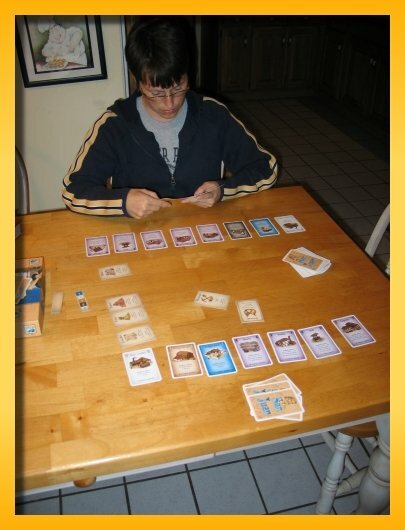 During production, the cards themselves become the goods produced in your mills, and a set of 5 market cards set the price for your goods during trading. The game ends immediately after the building phase when a player builds his 12th building. The two-player variant allows the Governor to choose a role a second time per round after his opponent chooses a role. This insures that three roles will be chosen every round before the Governor changes hands. The only rule modification for buildings is that if you’ve purchased the Library you do not get to double your privilege twice when you’re the Governor. Instead you must choose which time your privilege will be doubled. After the end game is triggered, victory points are summed across your built buildings and additional points are awarded for any special-powers violet buildings. The player with the largest number of victory points is the winner. And yes, I took my normal beating. Author mattPosted on October 8, 2005 January 27, 2016 Categories All Posts, Board GamesLeave a comment on I Juan to win sometime! If you cannot play you must draw a card or cause your opponent to Draw 2 or Draw 3 cards. There are also Free/Wild cards, Dodge, and Bounce cards that can be played to fight off being forced to draw cards. Cranium Zigity is a light game good for waiting until it’s time for bed when you’ve only got a few minutes. The nifty transparent cards are somewhat of a gimmick but they do make the game look pretty neat. Tonight was our monthly Analog Game Night for October 2005. We started a half an hour earlier this time and ended up with 6. The first hour was taken up by playing Hive, Coloretto, and Memoir ’44 but the bulk of the night belonged to our first playing of Power Grid. Paul and Ken played a round of Hive and then Ken played Keith. In the meantime, I coached Mat and Rich in playing half of the Pegasus Bridge scenario of Memoir ’44. While they were finishing that up, Keith, Ken, Paul, and I broke out Coloretto and played once through the deck which is technically only a quarter of a game but the timing worked out right after Rich and Mat finished a round of Hive. We then broke out Power Grid. Now this is kind of a monster of a game. Lots a wooden bits and lots of rules. I had read through them several times and played through a couple sample rounds with Sophie helping me. I struggled through the teaching phase and hopefully didn’t botch it up too badly. Unfortunately we immediately screwed up and didn’t reorder the randomly placed turn order markers after our first round of power plant auctions. Not reordering caused Ken to get the raw end of the deal during the resource buying and city building phases. Another rule we broke but caught after the first round was that the auction lead sticks with the leader until he passes or is the highest bidder for a power plant. I think we followed the rules okay after that. We only played the first ‘step’ but allowed purchases of 2nd connections in cities for those who didn’t get to buy until after someone got their 6th city. I think Power Grid is a keeper but it’s going to take several games before the zen of it will kick in. It’s a real money management game trying to figure out all of the variables to be able to buy power plants, buy resources to power them, and still have enough money left to build cities for them to power. The variable turn order is crucial to making the right decision given the rise and fall of resource prices during a round as well as the price of the ever shrinking city routes. In general we really messed up during our initial city placement (except Keith) and we clustered around the eastern seaboard. Next time, I’m sure we’ll spread out a bit more given we know what’s coming. Thanks to everyone for coming and thanks go out to Rich and his family for lending us their house for the evening. Next month’s AGN will be held on November 7th so mark your calendars.